Chemical peels involve the use of alpha hydroxy, trichloroacetic or phenol acids applied to the face to correct skin discoloration, acne or other imperfections. Chemical peels often take off the outer skin cells to remove wrinkles and blotches to expose fresh skin underneath, all in an attempt to increase collagen production and give the recipient a more youthful appearance. After receiving a chemical peel, the skin may be sensitive and require a special procedure for cleansing. Wait until 12 to 24 hours after a chemical peel to wash your face. Use a gentle cleanser that contains no salicylic or alpha hydroxy acids or other harsh chemicals. A soap such as Dove Cleansing Bar or an all-natural facial cleansing cream will work best. Use your fingertips to wash your face lightly. Do not use a washcloth. Wash twice a day to increase oil production. Apply the ointment you were prescribed by your doctor or esthetician after each cleansing procedure. If you were not prescribed an ointment, use at least a 50-SPF sunscreen to protect your skin. 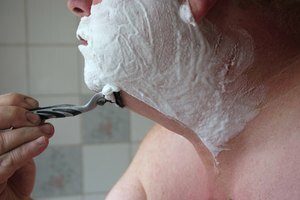 As the skin flakes and begins to peel, continue to wash twice daily, but be gentle. Do not remove the skin, but let it fall off naturally. You can use a washcloth at this point with a mild face wash to lightly exfoliate the dead skin. Continue to use 50-SPF sunscreen after each cleansing treatment. The face will be bright red for 7 to 10 days following a peel. You can usually apply makeup again from 7 days to 2 weeks after a peel to camouflage the redness. Avoid the sun for at least 2 months following a chemical peel. Take ibuprofen to dull any pain that might occur after a chemical peel. 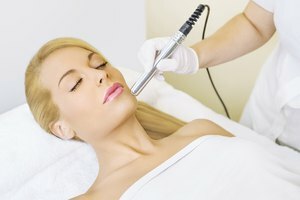 What Is a Diamond Peel Treatment?